There are some affiliate links in this post. That means, at no additional cost to you, I'll make a small commission if you should make a purchase. We are halfway through February, so, unfortunately, many busy moms have already dropped their fitness resolutions for the year. There are many reasons why us moms have a difficult time keeping a consistent workout schedule. We can’t find the time. It’s too expensive. It’s not enjoyable. Lack of time is the most common excuse moms have for not working out. As a busy mom myself, I know it’s a challenge to find the time to sneak a workout in. Yet, I know if I make time to watch The Bachelor, then I can certainly make some time for exercise. 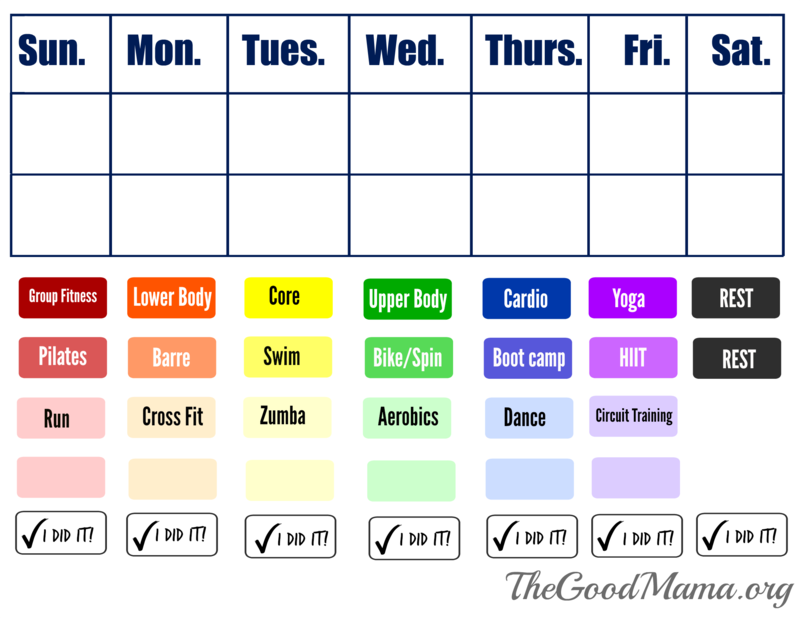 This Simple Printable Workout Calendar is a great tool for moms looking to stay on track and remain healthy and active. This workout calendar as a variety of different types of exercise, and it includes blank spots for your own workout. If I make sure to write down my workout plan for the week, I am more likely to complete it. Just print out this calendar, laminate if you’d like (or use clear tape or contact paper), and add some magnetic tape. You can stick it right on your fridge, so you know exactly what workout you have planned for the day. Also, I just have to share this wonderful article about how to start exercising and stick with it from the nonprofit HelpGuide.